Note: These examples of “In-Line” Art are all done with various brands of colored pencils, outlined with fine Sharpie markers or .05 Micron Pens, with the intent of making sure the text is still readable. 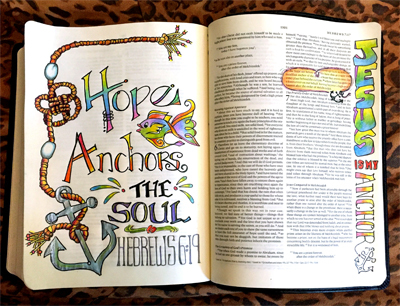 Once you have the basics of highlighting Bible verses under your belt, you can expand on those principles by adding “In-Line” or “In-Column” Art to your Bible Journaling. His confidence is severed, and his trust is a spiders Web. 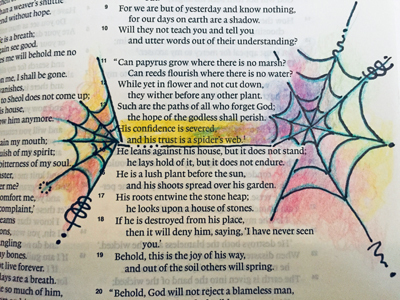 Highlighting Bible Verses does not have to be limited to adding color over the text or simply outlining around the words you want highlighted. 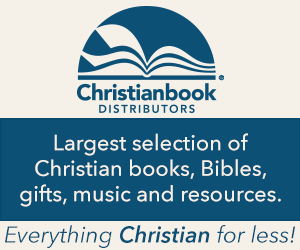 You can use this same technique to embellish narrow margin Bibles, your regular study or note taking Bibles without making the text unreadable. You can pull the theme of the rest of the art you have put on the page to add smaller details around your verse. Here I have 3 different ways to journal or embellish the same verse. 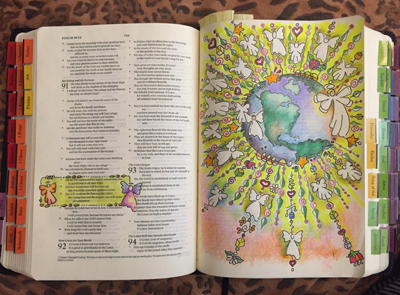 1) I put a full page of art into my interleaved Bible with the Bible verse at the bottom of the page. 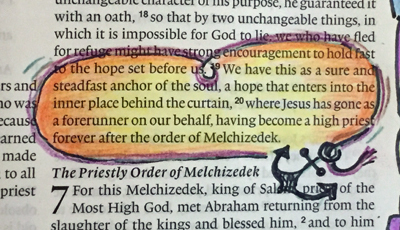 2) The interleaved Bibles have a medium narrow margin, so I broke the verse down to the least you could say, to celebrate the verse, incorporating an anchor into the swash of the last letter. 3) And I highlighted the verse by making a loose rope border around the verse and incorporating an anchor into the rope border, positioning the anchor where it covered the least amount of text. I started out with the round tip-in boarder from “Glorious Angels” with the three angels. I used the “Graphite Transfer Method” to draw the round border with the angels onto the blank page. 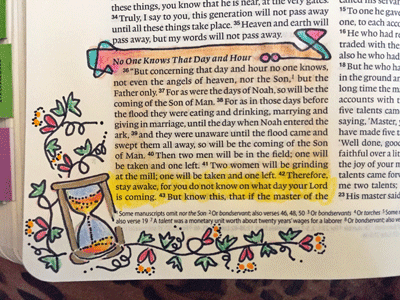 If you are not familiar with that method of getting art and lettering directly into your Bible, I would highly recommend you click on the link, which will open in a separate widow and familiarize yourself with this simple method. 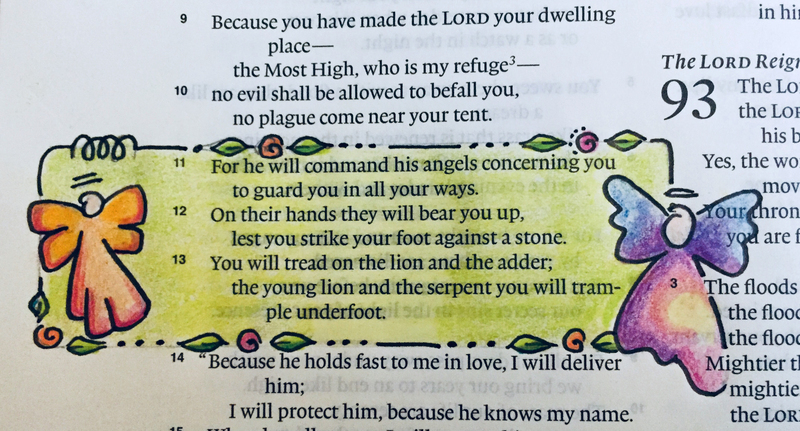 For the “In-Line” art, highlighting the verse, I copied the two smaller angels, one on each side of the verse and made a border around the verse using the same roses and leaves I used for the simple dangles on the art on the opposite page. If I had not done the full page art, the “In-Line” art would have been nice on it’s own. This is also a fine example of using the tip in art for inspiration and making it your own. 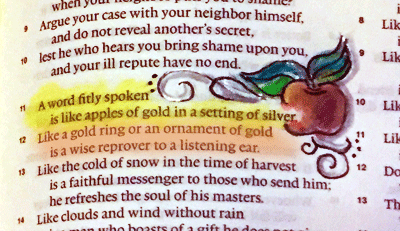 Example of using components from your Tip-In or Margin art for Highlighting the verse. 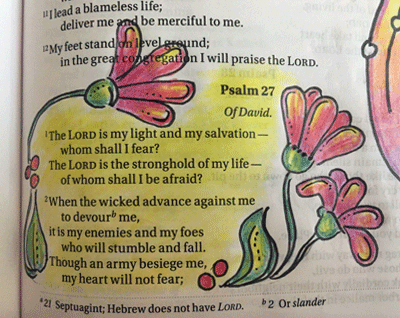 Depending on the layout of your Bible, there is often plenty of room for in-line art, especially in Psalms and Proverbs. 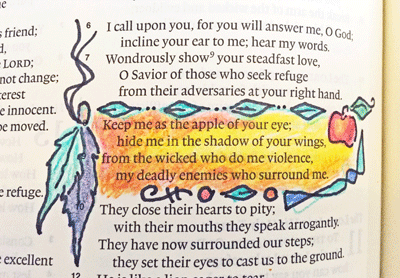 I never thought of doing that–simple yet very much highlights the verse in a special way. Love it. Karen, I’m thrilled you found this highlighting technique fun and doable! You will want to check out our first Highlighting article, which includes a 45-second video that will absolutely change the way you highlight all verses from here on out!